It’s called ‘the Underground’ or simply ‘the Tube’ by the nearly two and a half million people who make use of it every day. The London Underground has birthed innovations in areas as diverse as transportation, city planning, engineering, graphic design, corporate identity and marketing. Pivotal to its development was a man known as Frank Pick. In 1906 Pick joined the Underground Group as its head of marketing (or publishing officer as was called) at the behest of its chairman Sir George Gib. 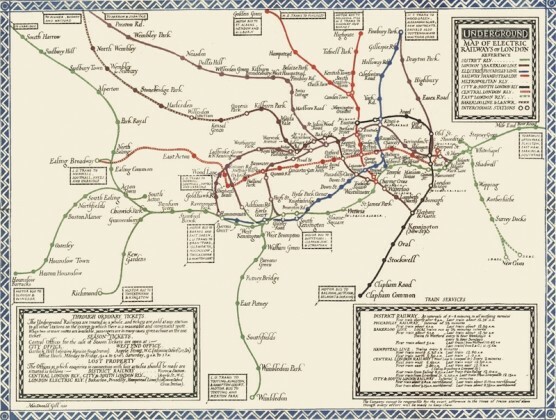 In those days the London metro system was basically a collective of indivual operators rather than a single entity. Although they had agreed to jointly promote the metro system under a single Underground brand the way their trains trains, stations and signage looked still varied considerably. Pick wanted to replace the clutter with a single, clear and consistant corporate design thoughout the entire system. In 1916 he commissioned a calligrapher named Edward Johnston to design a brand new typeface to be used on all posters and signage throughout the entire netwerk. Johnson did an excellent job; a slight variation of his original is still in use even today. Pick also asked Johnston to redesign the company’s logo as well. Johnson’s based his design on a 1907 original. Pick introduced the famous red bull’s eye with the dark blue bar across in 1918. But all wasn’t well yet. At the onset of the 1930s Pick faced another daunting challenge. The London metro system was rapidly expanding. Maps of the time show a complex entanglement of twisting and turning tracks on top the rather confusing road map of London. An overturned bowl of spaghetti that passengers found near impossible to navigate. Enter Harry Beck, a temporarily hired electrical engineer. Beck decided to radically redesign the whole map. Based on his knowledge of electrical circuit diagrams Beck created a schematic rather than a geographic representation of London’s underground system. A creative solution that proved to be bold as well as brilliant. Train routes were simplified to straight colour coded lines, drawn at 90 and 45 degree angles. Train stations were evenly spaced and represented by tabs and transfer points by diamonds instead of blob found on earlier maps. Except for the river Thames all surface detail such as roads and landmarks was removed. To people traveling beneath is anything above ground is essentially meaningless. The cluttered city centre was enlarged. This resulted in extra room and better legibility for an otherwise crowded and hard to decipher part of the map. Initially Beck’s colleagues were sceptical about his outlandish design, and suggested a version to be tested first in limited quantities. Their skepticism proved unfounded: the public loved it and found it much more easy to find their way around the metro system using it. 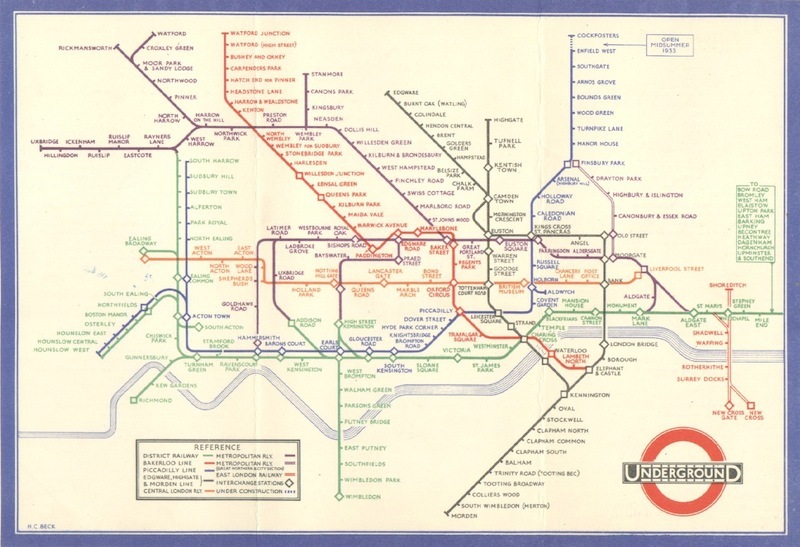 From 1933 onward Beck’s design would become Underground’s official map. Nearly every every major urban rail system in the world now has copied his innovative concept and developed a similar map. Many bus and other transportation companies have adopted it as well. This map radiates clarity, consistency and a refreshing kind of simplicity. It is iconic for good design. Intentioned or not, Beck’s innovation did another interesting thing. By visually enlarging the city centre, Beck had effectively shrunk its periphery. Destinations that hadn’t even been on the earlier maps – because they were too far removed from the city centre – all of a sudden became part of London’s immediate vicinity. For years Frank Pick had tirelessly promoted the Underground for leasure trips for years. Illuminated posters at station entrances advertised parks, museums, cinemas, historic houses and other places of interest that could be reached by the Underground. And now these place actually showed up on the map – only a few stations away. Hundreds of thousands of city dwellers found themselves spending their holidays and weekends in the country side. All because of Beck who decided to do something a little different. Nobody asked him too. Beck did all the work in his spare time. He got paid the equivalent of roughly two weeks of salary for his work – and despite being ousted in the 50’s continued to work on his map until the day he died in 1974. This entry was posted in opinions & ideas and tagged engineering, innovation by Bastiaan van de Werk. Bookmark the permalink. Good story — I didn’t know it was an electrical engineer but it makes perfect sense if you look at the logic of the map vs wiring. yup. His map also looks a bit like those green print boards you find inside computers and other digital electronics. over there I received my Air Jordan Retro 11 shoes today and I must say they are nice. I just wanted to thank you and let you know that I spent about 6 months looking for these shoes and consequently The shoes are great, well packaged, lightning quick shipping. A real professional operation. Look forward to doing business again with you in the future.